MP3 samples are available for all 5 songs! Click on the title of any song to hear a sample. You can also order up to two (yes that’s two!!) FREE MP3′s! Simply email me on the “contact me” page and request which songs you’d like. 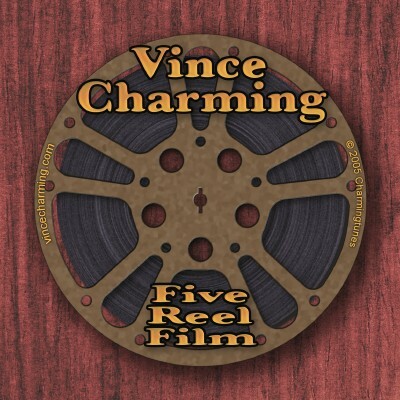 Now you may place an order via this website for your own copy of “Five Reel Film.” It sells for the low, low price of only $5 (plus shipping and handling). Go to the “Purchase” page for more details. Many months in the making, this piece of aural cinema represents the first official release in my nearly 16 year solo career. For those of you familiar with my solo acoustic shows and folkier tunes, “Five Reel…” may seem like a departure. However it blends many styles and influences that have been a part of my musical being since I first began to sing at age 4: a speck of folkiness, a pinch of country twang, a bit of Beatlesque harmony, a chunk of classic rock, a spot of musical melancholia, and a dash of psychedelia; yet each song is held together by the cinematic lyrical themes of memory, confronting the past, and trying to live in the present. Though primarily a solo effort, I could not have completed the CD with out the valuable musical contributions of Michael Grow whose tasteful lead guitar and lap steel add everything I cannot musically. Also helpful were the songwriting ideas of Alan Zucker and the vocal stylings of Randy Berge and Hali Hammer. When you see the cover, you will be dazzled by the original artwork of Howard Penner. Now you can read lyrics and the stories behind the songs. Keep checking back for more information.